DeSoto County is on track to have some major improvements to its road system finished next year, according to Mississippi Department of Transportation (MDOT) Northern District Commissioner Mike Tagert. The new construction of I-269 from the Tennessee state border to its connection with I-69 north of Hernando and the completion of the Coldwater River bridge south of Hernando on U.S. Highway 51 are both on schedule to be finished in 2018. 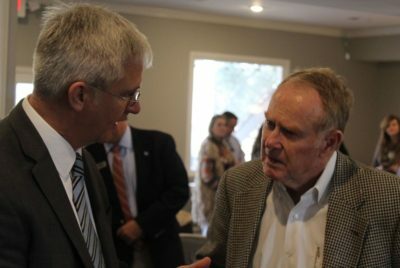 MDOT is also working forward on the widening to eight lanes of I-55 between Hernando and Southaven, although Tagert, in Olive Branch Tuesday to speak to the local Rotary Club, said it is moving slowly. As with many other projects, Tagert noted that paying for the project remains an issue with limited funding. Tagert did say DeSoto County drivers should be able to travel the finished portion of I-269 by the fall of 2018. The Northern District Commissioner didn’t speculate on how much of that project could be finished this year, saying the paving progress is at the discretion of the contractor. Meanwhile, motorists between Hernando and Senatobia will still have to detour on I-55 for the time being, instead of taking a direct Highway 51 route, with the construction of a new bridge over the Coldwater River. The road is currently closed at that point as a replacement to an aging bridge left unsafe after flooding in March 2016 left a four-inch crack is being constructed. Tagert said it is an expensive effort brought about more quickly than expected because of the damage to the bridge. Tagert pointed out a bridge project had already been planned for that location, but the damage caused those plans to be moved up ahead of what the Commission had hoped. In speaking to the Olive Branch Rotarians, Tagert said the signalization of State Highway 302, commonly known as Goodman Road, was about halfway to completion. Synchronization of the traffic signals is being done countywide to allow traffic to flow more smoothly on the busy roadway. What won’t be seen on Goodman Road anytime soon is the placement of medians to replace what are commonly called “suicide lanes.” The plan had been floated by MDOT to replace the middle turning lanes due to safety concerns, but Tagert said it is not a “doable” option because too many businesses along the highway would be adversely affected. Given the current network of roads in Mississippi and a tight budget, the Northern District Commissioner said MDOT has been forced to become more of a “Department of Maintenance,” doing its best to maintain current roads and bridges in the state. Thus, the current construction in DeSoto County may be the last new construction Mississippi will see for awhile.